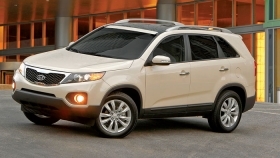 Sales of the Kia Sorento quadrupled to nearly 109,000 last year. SAN FRANCISCO -- Kia plans to add a third shift at its plant in West Point, Ga., to boost production of its Sorento crossover for dealers clamoring for the brand’s best-selling vehicle. Tom Loveless, Kia’s U.S. sales boss, said Kia Motors Manufacturing Georgia is recruiting workers to staff a third shift at the plant. He said no date has been set for the start of production. Boosting availability of its hot products will be a key issue for Kia as it tries to maintain momentum in the United States. In 2010, Kia posted a 19 percent increase in vehicle sales, boosting market share from 2.9 percent to 3.1 percent. Sales of the Sorento quadrupled to nearly 109,000 last year. Dealers have been reporting shortages for months. Inventories have also been tight for such other vehicles as the Sportage crossover and the redesigned Optima midsize sedan. Mark Scarpelli, owner of Raymond Kia in Antioch, Ill., said Loveless told dealers attending the brand’s make meeting that the ramp-up would depend on market demand. “Dealers are clamoring for the product, so within the next couple of months, they anticipate having that ramped up and have more production for that vehicle,” Scarpelli said. Lee Turner, a Kia dealer from Harrisburg, Pa., says Kia officials told dealers to expect “significant” growth this year -- and that dealers would be given enough product to support that growth.